It is sitting here even now in my family room against a wall that is too short to hide its open back. It’s a Mendelssohn upright piano made in Derby, Connecticut, sometime around 1905. You can still find something about it on the Internet. The serial number is something like 102. It’s old, the soundboard is cracked, it’s scratched and beaten, but for something that has celebrated its centennial, it sits up straight. And I love it for the memories it brings back and the people I most associate with it. I had it tuned several years ago for a choir retreat at my house. The tuner said the best he could do was tune it to itself because of the crack in the soundboard, but that was good enough. The fact that he was willing to tune it told me he appreciated it for the music it could still make. George Anton Piskac, about age three. My grandpa bought it used for my dad when he was between three and four years old, so the story came to me. 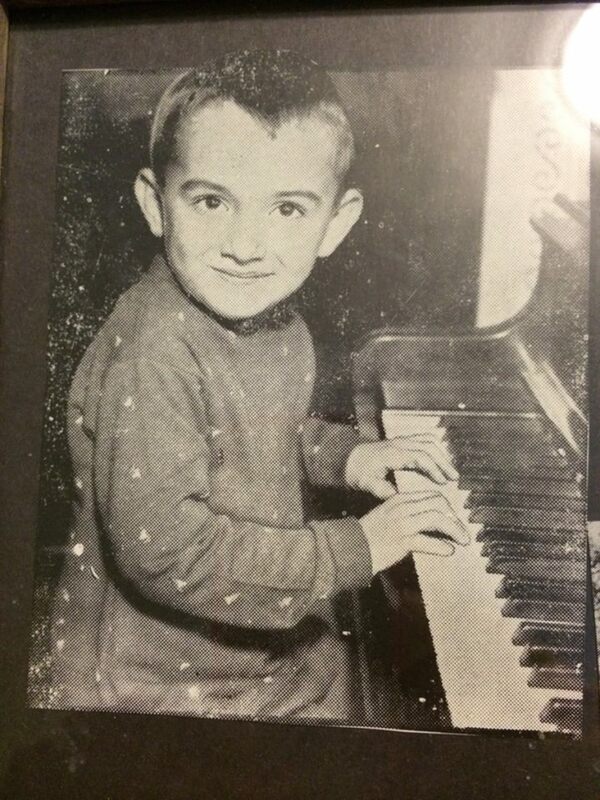 My dad was a musical prodigy. Why not? Everyone in his family had that musical gene! This picture of him at that tender age was in the local paper sometime around 1932 or 1933. Grandma used that photo as a publicity shot several years later when she sent a letter to MGM, suggesting that her young son would be perfectly cast as Jody in “The Yearling.” They didn’t choose him, but they did send her a nice letter back. But my dad tickled those ivories as he grew up. (They were actually ivory when that piano was manufactured!) And when he got married and had kids of his own, it came to our house and lived in the basement. I don’t know how many of us took lessons from his sister, our Aunt Suzy, but several of us did, including me. I wish I could say that I inherited that musical gene, but it seems to have skipped me when it comes to the piano…or any other instrument I tried. Susan could play, and still does! Mostly the Prescott kids used that piano for all kinds of other things, most of which had nothing to do with music. It still bears the scars and scratches of games we played with it. It was scaled, used as a launching pad, and other assorted adventures, and it was part of the structure of many forts we created down in the rec room. Grandpa refurbished it for us once, even replacing many of the missing ivories with synthetic materials, but it never ever looked like new. When I got married to Steve in 2002, we moved to a new house about seven blocks away. It took over a year to sell that house and we slowly moved my things to the new one. No rush. No one was buying anyway. My thought was that the piano could stay there for the new owners when they came. They would probably have kids, and kids need piano lessons, right? (All except Mike’s, that is.) I was wrong. 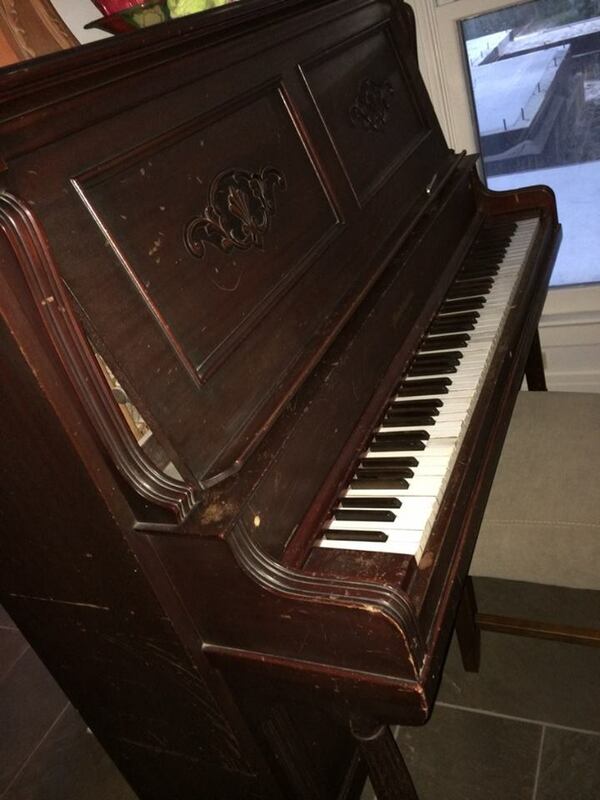 The house sold thirteen months later and the sales contract clearly indicated that the piano had to go. Still no one wanted to buy it and no one wanted it for free. I asked a local dealer, “What do people do with their old 100+ year old uprights?” His answer: We send them to the landfill. So once more I called the same piano mover to come and pick it up. They met me at my old house that day at that same outside back stairwell that led to the basement. Did I say it was steep? Three big guys yanked and pulled and maneuvered it up those concrete stairs, swearing all the way, complaining about how heavy it was. They were piano movers, the same ones who moved it down there. Aren’t they all heavy? They’re pianos, after all. Anyway, it took a long time to get it out of there and I just stood at the top of the stairs. My eyes were closed and I was trying to picture that old piano sitting on the landfill, surrounded by the other things we just throw away when we’re tired of them. And I couldn’t do it. All I could see was the old photo of my dad as I had never known him, a child full of promise, full of talent – full of music! – with his whole life ahead of him. I could see him sitting there in later years playing the “doodley-do” song for us, which is really called “Nola.” I could hear the notes. I could feel the pressure of the keys under my own fingers when I played for Aunt Suzy. I couldn’t do it. When they finally hoisted it to the top of the stairwell, I opened my eyes and said I had a new plan. Instead of driving it the twenty-five miles or so to the dump and waiting in line to unload it, what if they just drove it seven blocks away and moved it into my new house? No steps! Just come right in the back door. And there it sits. I still use it to pick out my choir parts. It’s not really playing, but it does help me make music. Others who can actually play have sat down to it and brought Christmas carols and other melodies out of it, and like I said, we used it at that choir retreat. There is still music to make with that old piano, even it doesn’t fit on that wall. And when I close my eyes, I can still see my dad and hear him play it. These photos and your thoughts echo inside me. I remember the piano lessons -this is up, this is down, let’s go up and down… and mostly the making of chocolate chip cookies in Aunt Suzy’s kitchen. Music pulls at all of us. Sitting next to our Dear Old Dad in church and hearing him sing the hymns brings me strength still and I can feel the music in my bones. I’m so glad you saved that piano. “This is up, this is down, let’s go up and down.” John W. Schaum piano lessons…I believe that was in the A book which was red. How it all floods back and makes me smile. What a wonderful series of memories and reflection. I have always loved seeing your dad’s piano, and now will enjoy it all the more.